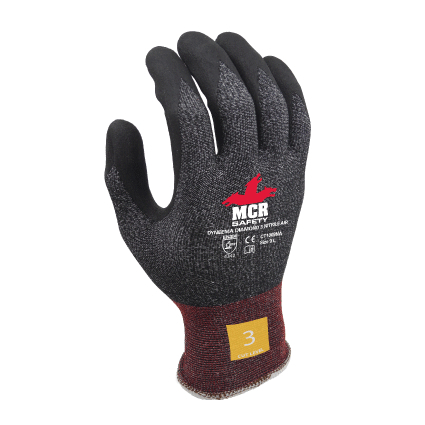 The MCR Safety CT1009NA Nitrile Air Diamond Dyneema Safety Gloves offer a brilliant level of grip in dry, wet and oily conditions while still providing a good level of cut resistance – ideal for automotive and steel industries. A secure fitting design makes them incredibly comfortable and easy to wear. The gloves have been made from incredibly tough Diamond Dyneema, offering a fantastic level of durability. Despite this, they're incredibly lightweight and comfortable to wear, making it easier than ever to carry out a huge range of tasks. The MCR Safety CT1009NA Diamond Dyneema gloves feature a nitrile air coating over the fingers and palms. This provides the gloves with an exceptional level of grip in wet, dry and even oily conditions. This enables the wearer to ensure that they have a secure grasp on whatever they're holding or carrying.